I am happy to announce our 6th Design Challenge, a design contest that we were used to organize at our Forums a long while ago. The theme of the challenge is to ‘Design for the Disadvantaged’: Design a product/service with social awareness to help the poor people or people with limited resources. The purpose of this challenge is to learn from each other, while competing and having fun. Therefore the challenge will be run in a WIP (Work in Progress) format. Participating is FREE and EASY. Just start your own thread HERE and make sure you share your design development with a lots of posts. 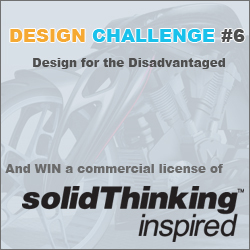 The first prize is a full commercial license of the solidThinking 8.5 inspired 3D CAD software. We invite you to participate NOW until the 3rd of June.